A good shoe is important to survival, be it in the city or out in the boonies. Without a good shoe, you may fail in your survival efforts. 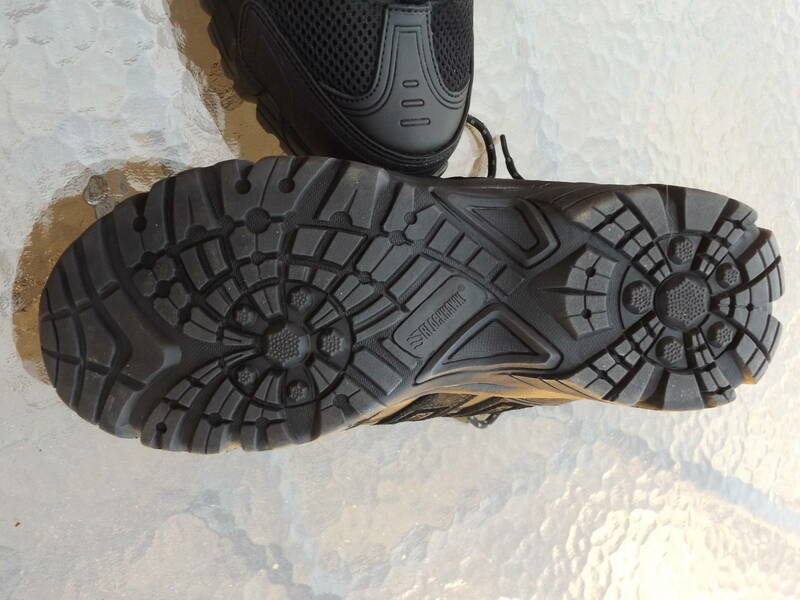 We’re looking at the Blackhawk Products Terrain Mid-Training shoe. I know. I know. We all have to watch how we spend our hard-earned money these days, and I’m no exception to this. I certainly understand the discount shoe stores and big box stores, who sell cheap shoes, and I mean this not only in price but that they’re cheaply made. Oh sure, they initially look really well made; however, in short order, they start to fall apart. There’s been more than a few times in my life when all I could afford were some “mart” shoes or hikers, because of a lack of funds. However, in the end, I wasted my hard-earned money. The footwear simply did not stand-up as I thought they would. One of the most important things you can do for yourself and your body, your feet in particular, is to outfit them with the best footwear you can buy. In the end, you really will save money over the discounted shoes you can find just about any place. It really is a no-brainer. If you ask me, it’s best to save up your money until you have enough to get good footwear. It’s just that simple. Our feet take a terrible beating every day when we walk on them, so why not treat our feet to the best shoes or boots we can find? If you are especially looking at long-term survival, you absolutely must get the best boots or shoes you can find. In my neck of the woods, in Western Oregon, we get a lot of rain. So, for me, that means I need water-proof hikers for seven months out of the year. I spend a lot of time outdoors, believe it or not, and wet feet are not any fun. If you are stuck outside for any length of time in a survival situation where your feet will get wet, you know how miserable your entire body gets. Wet feet are no fun, period! Furthermore, we’re not talking water “resistant” footwear; we are talking water-proof shoes or boots. Speaking of water-proof shoes or boots, you have to do your homework and make sure that they have a genuine water-proof lining and not just some spray-on water-proofing material. The spray-on material doesn’t last, at least not for long. Even if you purchase boots that have a water-proof lining, like Gore-Tex, it tends to break down after several years, and then your feet will get wet. Be advised. It isn’t necessary where I live to wear water-proof boots or hikers all year ‘round, but I often do. During the summer months, I can go without water-proof hikers. However, when the weather starts changing, I change my hikers. I have several pair of water-proof boots, too. These boots are worn during hunting season, whenever I get a chance to get out there and actually hunt. The higher boots are much better than mid cut or low cut hikers; the higher boots help keep my feet drier. I own one pair of Blackhawk boots that are water-proof. Unfortunately, they have discontinued that particular model. I use these water-proof boots sparingly. Enter the Blackhawk Terrain Mid-Training shoe, which is actually more of a hiker than a shoe. 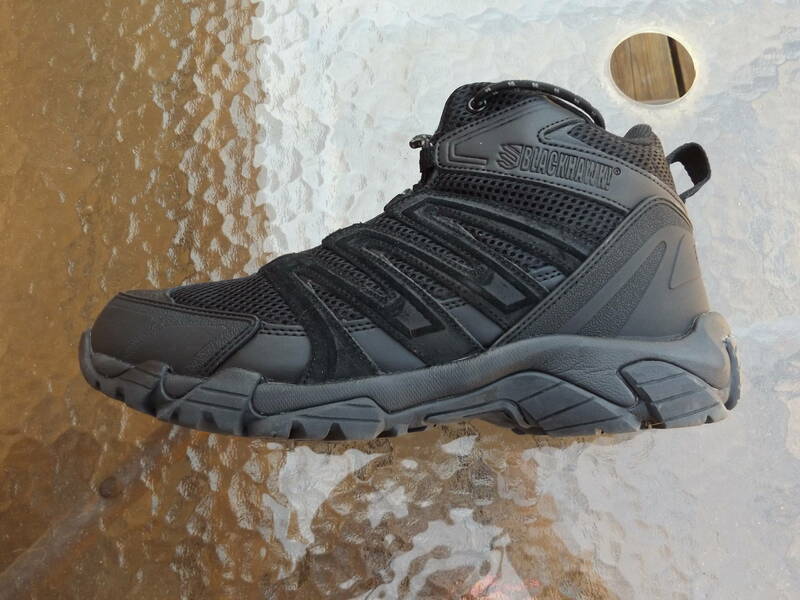 It’s not a high cut hiker but rather a “mid height” shoe that goes above the ankle. 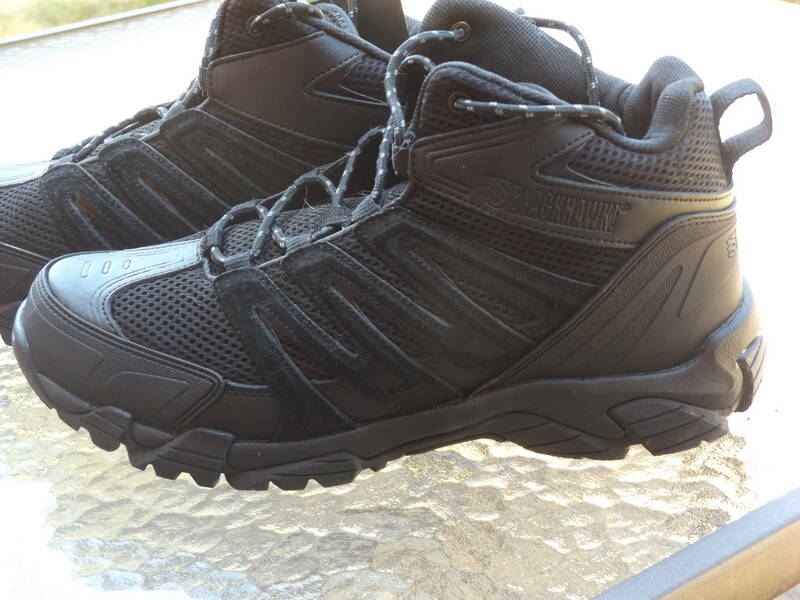 Blackhawk advertises these shoes on their website as “light-weight and comfortable, and versatile with the added strength of a boot.” These shoes are really great for law enforcement, security, or just everyday wear, if you ask me. breathable mesh upper, non-slip EVA rubber outsole, and an anti-microbial lining. The memory foam insole conforms to the foot and cushions every step you take, too. This shoe is only available in black, so be advised up front. However, black goes with just about any clothing you are wearing. The first thing I noticed, when I took the Terrain Mid Training Shoes out of the box, was how lightweight they are. That’s excellent! I don’t like wearing shoes or boots that feel like anchors on my feet. Secondly, when I put the shoes on, they felt like an old friend. There’s no break-in period needed, and this is also important to me. I’ve owned some pretty expensive boots in the past, costing well over $300, and it took a month or longer before they conformed to my feet and were really comfortable. So, when a pair of shoes comes out of the box and is a good fit and comfortable, I’m jumping on the bandwagon. The workmanship is second to none on these boots. Not a flaw could be spotted. The non-slip EVA outer sole is something to see. The design and material means that these soles really grip in any weather and any terrain, outside of walking on ice. I just love it when a new pair of shoes or boots feel great on my feet right out of the box. Wish I had these shoes when I was in law enforcement or doing private security work. Yeah, I had some “police” shoes, and they were “okay” for the most part, but they just never felt like an old friend the way these Blackhawk shoes feel on my feet. I’m really fussy, or particular, when it comes to footwear. That’s not a bad thing. On my recent yearly doctor visit, my new doctor wanted to check out my feet, and he said I had the youngest looking feet for a gent my age. I try to take care of my feet as best I can. They’re the only ones I’ll have. 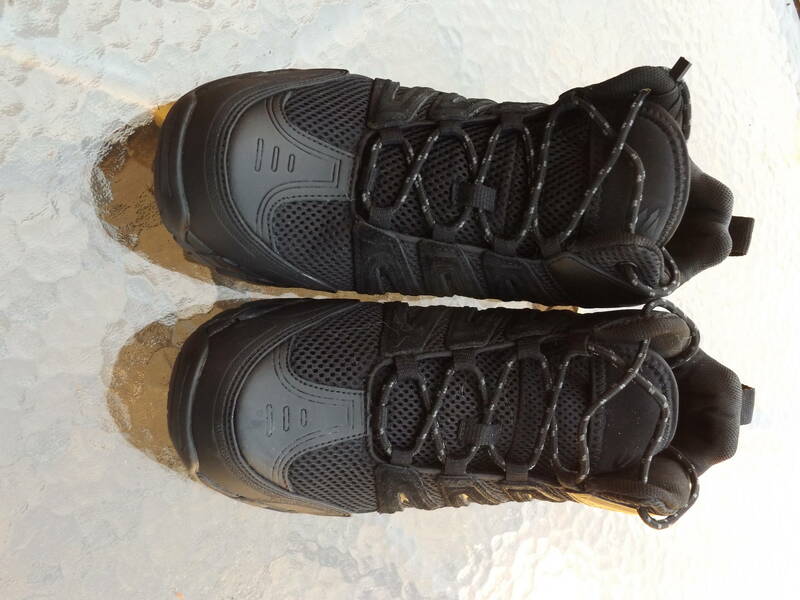 I wore these Terrain Mid Training Shoes on and off over the past summer, and I was very pleased with how they performed. Living out in the boonies, we don’t have a lot of paved roads to hike on, but there are plenty of dirt/gravel logging roads to explore, and you really need a good pair of shoes or boots– something that will grip the road and not allow you to fall. Since my hip replacement well over a year and a half ago, I’ve become more than a little self-conscious about falling. I was advised that it simply isn’t a good idea to take a bad fall with the new hip, and I haven’t! I don’t want to go through that surgery and long recovery period again, so good shoes that grip the road are important all that much more to me. Full retail price on these Blackhawk shoes is $79.99. I honestly expected them to cost a bit more than that. I do shop around and keep a pulse on the price of a lot of things. I’ve had similar boots in the past. While these other boots performed as advertised, they were actually a lot more money than these shoes from Blackhawk. The only “bad” thing is, they aren’t water-proof. I have sprayed them several times with some water-proofing spray to help repel the rain. If I plan on being outside any length of time, during the wet weather we have seven months out of the year, I’ll wear one of my water-proof hikers. However, for short-term wet weather wear, these shoes from Blackhawk will sure get the job done. A can of spray-on water-repellent isn’t a bad idea to use on any shoes or boots, even the ones that are actually water-proof; it helps preserve the leather and fabric for a good long time. Previous PostRecipe of the Week: Welsh Rarebit, by A.J. Thank you for this review; I am looking for some work boots, and maybe shoes as well. Based on your review I’ve found what I’m looking for. Does “mid height” mean about 6 inches tall? That seems to be a common height for many hiking shoes. Check out Limmer Boots out of NH. Even their stock of the shelf boots are solid. I don’t see that they make them in wide widths. Shame, they look like a good option. Folks, after Korea, I have canvassed all sites/programs for cold weather gear. AND I found it. Check out WIGGY’S in Colorado. New material that does all better than wood. Boots to clothing, complete outfits. Sleeping bags are superior to anything out there, by far. What I wear in the outdoors is my Wolverine boots. They are very comfortable, durable, and mine is definitely waterproof from me walking through water. I have had mine for 9 years and they are still going good. Cheap shoes lack proper arch support. I learned this painfully with a good case of plantar fasciitis after walking around a huge manufacturing plant all day for three decades. Had some cheap LE nylon and leather boots for too long and my arches collapsed. So cheap shoes will rob you in more ways than one. But the lifespan issue is critical for the prepper in still another way: the shoe store will be closed for a long, long time if we lose the grid. So don’t toss those “old” shoes too quickly. Thanks for this review, Pat. I looked on the Blackhawk website and was pleasantly surprised they came in sizes down to 7. With some nice wool socks, I think that size would fit me, and the price is certainly reasonable. This is a well-written report on what appears to be a good quality product. One aspect that is almost never discussed is the ability of a shoe to dissipate static electricity. Aside from annoying static shock, damage to sensitive solid-state electronics is a very real danger to anyone working with amateur radio, computers, etc. I would welcome an article for Survival Blog on the subject of static electricity and how to control and manage it in a survival situation. Not avail in Wide sizes, to bad. Thank you for this review. I’m going to take a closer look at these. I don’t mind a non-waterproof boot as my feet breathe more. If boot manufacturers are reading this… One of the things I absolutely cannot stand is the tongue of the boot that doesn’t come up above the top lace tie off area by more than a few millimeters. At some point a lot of boot designers thought this design would be a good idea. It is extremely uncomfortable to have laces at the very top of the tongue. I’ve been buying boots from a couple of manufacturers for many years and this newer design is why I quit buying their products. I thought I was the only one until I started talking to hunters in my area. Everyone seems to have a pair of boots in their closet they’ve pretty much relegated to using for changing the oil on their trucks and this short tongue is a feature they simply cannot stand. Another good boot is Altai. For Those looking for a Wider toe Box, look in to Kean boots and the all leather options for hiking. For day to day wearing all the time, I have almost 3 years on my current (2)pair. I am Going to say outright I wear them winter long here in the 49th state. They are light on the ankle support but they are warm and don’t pinch the toes and are available in wider sizes. They are not the $50 buck budget boots, but if you wear them a full year, how much is $15 bucks for a month of comfort? Think long term and how your feet and the rest of you will feel better. If I need a harder work boot I go to my old tried and true Ft. Lewis Boots by Danner. For real cold stuff it is the bunny boots. One thing you might want to look into for an upcoming article, Cyclone XII shotgun! I am a forester by profession and invested in a pair of whites boots from spokane. They are custom built and handmade, takes about 6 weeks to deliver. They are full leather, rebuild able, water resistant but only three season (not insulated). They have a high arch. I can wear them 12 hours a day if need be. I get about 2 years out of them between rebuilds. I deduced that for 2 years between rebuilds would otherwise have purchased 4 pair of chippewas boots to the tune of $800. I purchased in 2011 and will be sending them in for the third rebuild. I wear daily for work and play, incredibly durable and comfortable custom fit. They feel like ankles and feet are wrapped in an ace bandage. Original purchase prices was $435, and $450 in rebuilds thus far. I am into the boots for about $900 in seven years. Compared to an estimated 14 pairs of lesser boots at $1400 total cost, I am definatelty ahead financially and in comfort. Sorry, my math is off, 14 pairs of boots at $200/pair is $2800. It is late. Happy New Year. Where is the Blackhawk made?